blog.bodie.com/history/bodie-railway/ The 'Inyo' Engine of the Bodie Benton Railway. To meet the ever increasing demand for lumber and cord wood the Bodie Railway and Lumber Company was formed in February 1881. Timber was harvested from various tracts to the south. It was milled at this site and then shipped to Bodie on the railroad via Warm Springs and Lime Kiln. The sawmill was a two story structure capable of producing 80,000 board feet in a 10 hour shift (when the crew was sober) and was powered by a 16 inch steam engine. With the development of electricity at Green Creek and reduced gold production in Bodie, Aurora, and Masonic, the demand for lumber and fuel wood diminished and Mono Mills was abandoned in 1917. - Dedicated September 9, 1989 - Bodie Chapter No. 64 - E. Clampus Vitus. 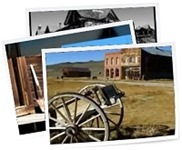 Or, click here to see all images tagged as “Bodie Railway”.